Are you looking to create environmental graphics to enhance your office space, university, gym, retail space, museum or restaurant? Environmental graphics, also known as supergraphics, can convey the tone and professionalism of your company in a powerful way. With SpeedPro Imaging, you’ll be gaining a partner that aims to meet and surpass your every expectation. As the nation’s biggest large-format graphics provider, we offer the technology, resources and expertise to create high-quality supergraphics that make a lasting impression. Environmental graphics are adhesive graphics that can be applied to doors, windows, floors, walls or ceilings to enhance your environment. What differentiates environmental graphic design from other types of signage is that it aims to change the space in a fundamental way. An environmental graphic isn’t just a small addition to a space. It transforms the area to create a new feeling, convey important information or alter the way that people use the space. The term “environmental graphics” is closely related to the term “supergraphics.” Supergraphics could be considered a type of environmental graphic. They’re characterized by their size and the fact that they change the feeling of a space. Supergraphics are typically large and take up a significant portion of a room or even a whole building, and they’re often eye-catching and may involve bright colors, bold shapes and meaningful text or imagery. Today, they may also incorporate digital and multi-media aspects. Environmental graphics use the principles of environmental graphic design (EGD), also called experiential graphic design (XGD). They’re just one tool that environmental graphic designers can use to transform a space. What is EGD? It’s a field of graphic design that combines various design disciplines to connect people to a place, bring meaning to it and impact the way visitors experience it. It uses elements of graphic, interior, architectural, industrial, landscape and other types of design. It may aim to assist with wayfinding, communicating information or establishing a brand identity. You can find evidence of environmental graphic design in a vast range of locations and situations. In fact, the concept of environmental design has been around since people first started using painting on cave walls to tell stories. In its modern iteration, however, the field is relatively young. The Society for Experiential Graphic Design was established just 45 years ago in 1973. At the time of its founding, it was called the Society for Environmental Graphic Design. The Board of SEGD decided to change the name of the organization in 2013 because the field was expanding into new areas, and they wanted to avoid confusion related to the term “environmental” and the environmental movement. Wayfinding: Wayfinding deals with the signage and other materials that help people navigate around an environment. It can consist of directional signage, maps and symbols that mark the purpose of a location. Wayfinding signs may include arrows pointing to an exit, a sign marking which floor of a building someone is on and free-standing map displays. Placemaking and identity: Environmental graphic design can help to differentiate a place and create a sense of “you are here.” It might include branded signage, such as a company logo or a design that conveys a brand’s personality. It might also help to express the unique culture of a city by incorporating, for instance, images of famous people from the town’s history or cultural events the city is known for. EGD can also help create the desired atmosphere in a room or building. A hospital typically aims for a clean and professional feel, for example. Exhibition design: EGD also encompasses exhibitions such as those in museums as well as temporary exhibits. The designers who work on these exhibitions aim to make the information they convey easy to access and understand. To accomplish this goal, they may include the use of graphics and multi-media tools. Public space design: Public spaces and installations must also be designed, and they typically incorporate elements of environmental graphic design. EGD helps to add meaning and context to artwork, memorials, parks, landmarks, signage and other public spaces. The design of a memorial, for example, would likely create a somber feeling. A playground, on the other hand, would use bright, lively colors. Environmental graphics and designs can be used in all of these areas to help create the overall feeling of a space. They may relate to multiple aspects of experiential graphic design. For example, a wall decal might include arrows to provide directions but also use bright colors, playful fonts and the company logo to help convey a company culture or brand identity. Wall coverings: The walls of your building are blank canvases. Don’t let that opportunity go to waste. When you take advantage of our wall coverings, you can bring your game to the next level. A full-color, high-resolution wall-to-wall muralsays a lot about your business without being salesy and will leave an impression on your guests. We can print any design with exact color-matching precision on a variety of materials. We’ll even complete on-site surveying to make sure there will be a good fit before installation. Floor graphics: The floor is another excellent place for supergraphics. You can put a large company logo on the floor of your lobby, place an advertisement on the ground outside or put down arrows or footprints to help people navigate throughout a building. Large graphics look especially impressive from above. We can print floor graphics for both indoor and outdoor use that will adhere to a range of materials. Our specialty non-slip laminates meet national standards ratings. Window graphics:Glass surfaces are essential for branding. Window graphics can enhance any glass surface, whether it’s the window facing the outside of a business or an interior glass wall. These graphics can serve as eye-catching visuals — like storefront window displays — and can add privacy as well. With our impressive selection of perforated films, vinyl graphics and clings, we should be entirely capable of fulfilling your every request. Acrylic graphics: Acrylic makes for a bold, instantly recognizable addition to your office space. It’s an extremely versatile material, as our experts can manipulate it to fit a variety of sizes, colors and shapes. You can even add a dimensional quality to your company images and logos or use interesting decorative features. The graphics and services we offer can be used to accomplish a plethora of goals, as you can add to the ambiance of your restaurant with tasteful wall art or display your school’s pride in powerful fashion with a printed mascot. To understand what you want and need, we’ll discuss your ideas in an in-depth consultation. It’s there that we’ll show you options from our product catalog. Some of the most popular uses for environmental graphics follow. Environmental graphics are perfect for making a space convey a brand’s identity or a company’s culture. They can meet this need directly by using a company’s logo, slogan or colors. They can also match the brand’s personality for a more subtle statement. For example, a company that brands itself as fun might use bright colors and put humorous quotes on the wall. A brand with a more serious personality might use muted tones. Environmental graphics can also help people learn about the company and their surroundings. A wall covering might include arrows or the number of the floor you’re on. A floor graphic might use arrows to create a path for visitors to follow. Supergraphics are also a creative way to convey information such as company values or the rules for using a facility. You might also use environmental graphics to help inspire a particular state of mind and improve performance. For instance, you could put inspirational quotes on the wall. In a gym, those quotes could be from famous athletes. In an office meeting room used for brainstorming, you could place quotes related to creativity. Other elements of interior design may also impact performance. A University of Texas study showed that gray, beige and white office walls led to feelings of sadness among employees, especially in women. Men had similar emotions in orange and purple workspaces. Light blue and green, on the other hand, are believed to promote calm and focus, while red increases heart rate and blood flow. Environmental graphics can also temporarily transform a space for a special event being held there. Supergraphics can take a conference center, stadium or office building and infuse it with the personality of the event occuring there. With well-designed, unique environmental graphics, an attendee will walk into the building and know for sure that they’re in the right place. You can make sure by displaying the logo of the organization hosting the event, showing pictures related to the event or creating displays that match the event’s personality. Environmental graphics offer numerous benefits that make them an excellent choice for transforming a room or building, including the following. With environmental graphics, you can quickly and affordably change a space to suit your needs. Through the principles of environmental graphic design, graphics can completely transform a space. Of course, adding graphics is much faster and more affordable than an architectural redesign. You can even change an area multiple times to accommodate various events that take place there. When it comes to environmental graphic design, you can choose from a large variety of materials and design types. We have a wide range of capabilities that allow us to print graphics tailored to fit any space, and we can customize our products to meet the needs of your project. The versatility of environmental graphics also enables you to be creative in your designs to convey your brand personality or message in a unique way. 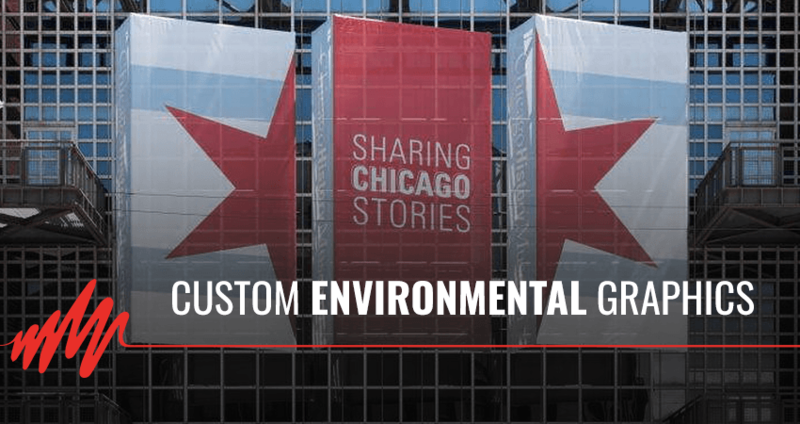 Environmental graphics are often large and can include bright, bold imagery. Additionally, they can transform an entire room or building, making them hard to miss. These attributes make an impression on visitors that lasts long after they leave the room, which is helpful for branding because it helps create a strong brand identity and causes your brand to stick in people’s minds. Environmental graphics can help you get the most out of your space by enabling you to improve it to suit your needs. Real estate is a significant investment, so you should optimize it for how you plan to use it. Environmental graphics are an effective and affordable way to do that. Understand the communication objectives: The first step is to make sure you understand the communication objectives of the project. The message you’re trying to convey will help guide you through every other step in the process. When we’re working with our clients, we make sure we understand their goals so that we can help them succeed. Understand the space: Environmental graphics need to work with the space they’re in so that they appear as an integral component rather than just an afterthought. We seek to understand the area we’re working with and tailor our graphics to it. Consider all design elements: You’ll have various design tools at your disposal when you’re creating environmental graphics, and you can use them to get your message across. These tools include materials, colors, images, text, fonts and placement. Make sure each element contributes to meeting your communication goals. Consider the audience: Your audience is another critical factor that you need to keep in mind. Think about who will see the graphics and any unique perspectives they may have. You can tailor your graphics to these perspectives. For example, if your audience is filled with sports enthusiasts, you may use quotes from famous athletes in your designs. Consider practical aspects: If your graphics are going to be used to convey information or help people navigate a building, make sure the information is legible, easy to see and easy to understand. Want to optimize your space and make it memorable, practical and purposeful? Environmental graphics from SpeedPro are the perfect solution. We’ll work with you to help determine the ideal products for you, and we have the expertise and equipment to deliver high-quality results, even for challenging projects.